[PDF] Oxford Handbook of Tropical Medicine (Oxford Handbooks Series) | Free eBooks Download - EBOOKEE! 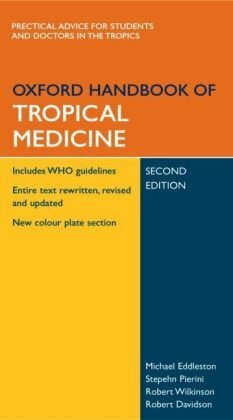 Description: The Oxford Handbook of Tropical Medicine provides clear and concise coverage of this area of medicine for students and practitioners in the tropics. Medical conditions are ordered by system except for the five major tropical conditions - malaria, HIV/STDs, tuberculosis, diarrhoeal diseases, and acute respiratory infections and fevers. The book has been designed to be as practical as possible with illustrations of blood films and stool smears, which are useful for diagnosis, as well as the usual clinical features, diagnosis, and management. The new edition includes a major revision to the cardiology, chest medicine, renal, and endocrinology sections and there is new material on mental health, managing acute medical emergencies and ophthalmology. No comments for "[PDF] Oxford Handbook of Tropical Medicine (Oxford Handbooks Series)".